Announcing Cookography’s first contest: The Great Greek Yogurt Haiku Contest! Simply write a haiku about: Yogurt, Vermont (Stonyfield is in Vermont, and we love Vermont), and/or Greece (we also love Greece!) It has to be a proper haiku (5-7-5) and left as a comment to this post by May 31, Midnight EST. We will award the best entry a bunch of coupons for free yogurt, and we will give the runner-up just a couple. You only have one week, so hurry!! If no one enters we have no problem keeping all the coupons for ourselves! If you are scared that if you win you might end up with more yogurt than you know what to do with…don’t worry! While Greek yogurt tastes great eaten right from the container, it is also great for cooking. Use it instead of sour cream when making dips or on top of Greek Shrimp with Feta. AWESOME…nothing can better than that!! Keep move on..
Hey, what a great idea! I am a big fan of Greek yogurt and of haiku. In fact, I am a past president of the Haiku Society of America, former editor of the journal Modern Haiku, and currently editor of Modern Haiku Press. If you are going to have another contest, I would delighted to be a part of it. Thanks for all the wonderful haikus! Luke and I and 4 friends voted…it was close, but we have a winner! 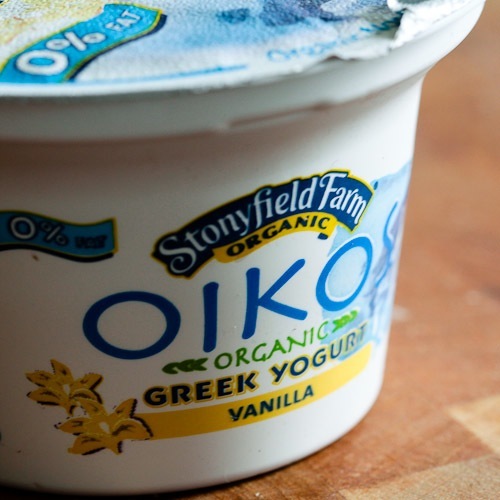 Coupons for free Stonyfield Farms Oikos Greek Yogurt are on their way! Thanks everyone for making the first Cookography haiku contest a success! I know I missed the deadline, but I will haiku anyway. I think we can count it in… We are convening the judging panel tonight over beers! We will post the tally tonight. These are excellent. Mary – I’m laughing so hard at yours, I love it!